TheMetalBikini.com- X-Wing Miniatures and more: Rebel Aces Reveal by Sean! 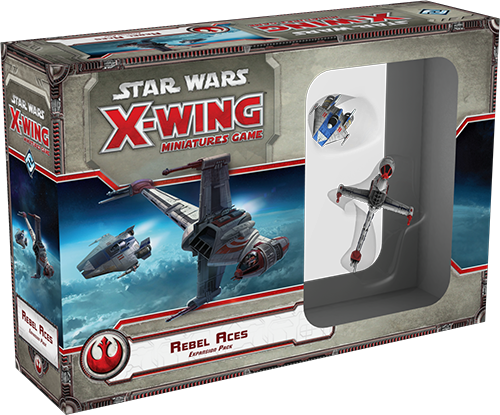 So, on Friday, FFG treated us to another reveal in regard to the upcoming Rebel Aces expansion. A variety of the matters discussed in the reveal have already been out there for a while, but I think this reveal gave us our first official look at the last Rebel Aces unique pilot, Nera Dantels (PS 5); the B-Wing E-2 modification (which gives you the Crew symbol in your B-Wing upgrade slot for 1 point); and two new Crew Members, Jan Ors and Kyle Katarn. So let’s take a look at these new goodies and see what kinds of trouble we can get into, shall we? First up, Nera Dantels. Nera Dantels is seriously interesting. At 26 squad points, she’s the cheapest named pilot you can take on a B-Wing, and she’s arguably got one of the coolest card text abilities out there. Her card text effectively allows her to shoot her torpedoes in any direction she wants (i.e. 360 degrees, yo!). That’s pretty nasty if you think about it. So what kind of upgrades do you want to take on her? Well, for starters, if you’re going to pay the two point increase over the cost of a 24 point Dagger Squadron pilot, you need to recognize that what you’re getting for those 2 points is 1 point of PS and her card text ability. As a result, if you aren’t sticking torps on her, then there’s probably no reason to take her. Take a Dagger instead. Personally, I think if you’re going with Nera, you should load her down with two sets of torpedoes. Which torpedoes you choose is going to depend on how you want her to function in your list, but let’s look at some interesting combinations. And while we’re at it, let’s look at the B-Wing/E-2 modification too, since it is a part of those aforesaid “interesting combinations”. The B-Wing/E-2 modification lets you mod your B-Wing to add a crew member. It is useable on the B-Wing only. 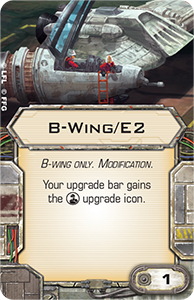 This is a fantastic upgrade for a B-Wing in general, and Nera in particular, and at only 1 point, it’s likely to see a lot of use. Adding this mod to Nera will let you do a number of cool things to take full advantage of her 360 degrees of freedom to launch her torps at damn near anyone she wants. So what kinds of cool things, i.e. cool Crew Members can we add? Well let’s take a look. Putting Mercenary Copilot in the front seat is really a good combination for loading Nera out with 2 sets of Proton Torpedoes. This build is going to give you better odds for landing multiple crits with your Proton Torpedoes which, as you may recall, upgrade one focus result to a crit result to begin with. The Merc Copilot upgrades a hit to a crit at Range 3, so if you play it right, you could have her crittin’ for days on a number of potential targets. Another idea is to stick Weapons Engineer in her cockpit with basically any set of torps you like. If you do this, Nera’s going to be able to maintain two TLs with Weapons Engineer, so she’ll be more likely ready to go when the moment is right. It’s kinda like Cialis, for omni-directional torpedo-launching chicks. I like the idea of using Weapons Engineer with one load of Advanced Proton Torpedoes and one load of either Flechette or Proton Torpedoes, as that gives her, initially, the ability to fire a torp at Range 1, 2, or 3 and in 360 degrees. If your game lasts more than four hours with this build, consider letting a 2-1B surgical droid play your games for you. Also, you might want to think about running her with Advanced Sensors too. Just to get her in the right position. Another solid idea is to give her a Recon Specialist which will give her an extra focus token when she declares a focus action, and pair that with… you guessed it: Deadeye. Put these two pieces together with two loads of Advanced Proton Torpedoes, and anybody within Range 1 of her is gonna be hurtin’. Is it expensive? Yeah. But if you can get her at Range 1 of ANYBODY and survive for two turns, then you have fairly high odds of almost dropping two of your opponent’s ships right there. And hey, it’s only 43 points. You could do a lot worse. Fire Control System (FCS) could really be handy on Nera also. Coupling FCS with Weapons Engineer could be a really nasty combination on Nera too, since you probably then never need to worry much about your target locks being in place, and can focus on focusing. The B-Wing/E-2 mod also works well on other unique B-Wing pilots. Most of the above torpedo heavy combinations work fairly well on the likes of Ten Numb, Ibtisam, and Keyan Farlander as well, but a few are worthy of specific mention. Putting Mercenary Copilot in front of Ten Numb means when Ten Numb shoots at Range 3, he almost certainly will have a crit result that can’t be cancelled. Nien Nunb works well as a Crewman on most B-Wings because for 1 point he provides two additional green maneuvers (3 and 4 straight), but I’d be hesitant to take him on Ibtisam or Keyan Farlander, since both of their card text abilities rely on having stress during the combat phase, which Nien Nunb will make you more likely to shed during the activation phase. What about Kyle Katarn, Crew Member? Is he any good on these B-Wings? The new Kyle Katarn crew card works well on the B-Wing also, in my opinion. Again, I’d be hesitant to take him on Ibtisam for the same reason as Nien Nunb. But I say hesitant, not reluctant. If you’re going to do it, then you gotta pay attention to what you’re planning on doing with him. In order to use him, you will likely have to have removed stress via pulling a green maneuver in the activation phase, meaning you likely won’t be taking advantage of Ibtisam’s card text ability which relies on her being stressed. So if we want to make Katarn work for Ibtisam, we need to think about how we can do it most effectively. If you have Ibtisam with Push the Limit (PTL) or Opportunist then you may be able to generate a stress token immediately after you have shed one. In those situations Katarn could be quite good as Ibtisam’s copilot because things will go down like this: Ibtisam pulls a green, loses her stress, assigns herself a focus token via Kyle and then, with PTL, takes two of her actions (TL, focus or barrel roll) and winds up stressed again right before she gets to shoot. This effectively gives her the chance to have the benefit of all three of her actions EVERY TURN. The only issue is that in order to make Katarn work in this scenario, Ibtisam’s movement is very limited since she doesn’t have many green maneuvers, and you’ll need to make a green move basically every turn you want to pull this off. How often you can you do that? Well, that’s the real trick isn’t it? But it’s awesome when you can pull it off. But check out Kyle Katarn: Crew Member on Keyan Farlander. Now there’s synergy if you’ve ever seen it, right? When attacking with Farlander, you can remove a stress token to switch all of your focus results to hit results. And when this happens, Katarn lets you assign Farlander a focus token. But wait a tick, you’re going to get that focus token after you’ve fired, and Farlander’s card text ability basically gives you almost an auto-focus anyway, right? Well, yeah. So in this situation you could only use that focus on defense and that means only 1 in 4 times will it be useful, but Farlander’s going to get shot a lot and it’s bound to save you a point of damage here and there. Is this worth it? Maybe not. Stress token mitigation on Farlander is probably better served by using his card text ability than by using Katarn, and you certainly don’t want to be dumping stress tokens off Farlander by pulling green maneuvers. You want to use them for his card text ability and pull repeated reds every turn. So when you’re looking at defense options to go in the second B-Wing/E-2 seat, there are probably a couple of better options than bootstrapping Crew Member: Kyle into that role. Using Chewbacca or C-3PO as a Crew Member on any B-Wing is probably a reasonable idea if you’re looking for defense, as those guys make your B-Wing a bit more survivable. Of course, Gunner or Luke Skywalker, Crew Members, could be worthwhile to give your B-Wing another shot when you miss. With a 3 primary, a gunner ain’t a horrible idea, and remember, if you’re sporting torps, these guys add a bit of insurance against a missed shot. Sticking Gunner on Nera with a couple of flechette torpedoes might be a waste of 5 or 6 points… or it might not. That build costs 37 points and gives you a lot of flexibility. With that combo, you can shoot at some guy at Range 3 behind you, blow the roll and then he’s getting a stress token anyway and you’re then shooting at someone else at Range 2 in front of you with Gunner and maybe doing some damage there instead. Fundamentally, Kyle Katarn: Crew Member can ride along in 3 ships, YT-1300, HWK-290, and B-Wing with B-Wing/E-2 mod. In general, he’s useful with B-Wings because B-Wings have a lot of red maneuvers which means B-Wings get stressed and then do green maneuvers which results in Katarn assigning a focus token to said B-Wing. This generally means that in those circumstances, your B-Wing will get the effective benefit of an extra action (i.e. a focus token). Katarn is very effective on a B-Wing with torpedoes because he assigns a focus token after stress is removed, leaving the B-Wing free to TL an opponent in its firing arc and then immediately launch torpedoes. 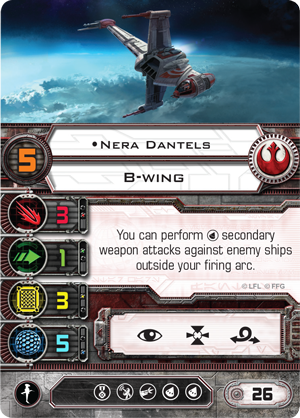 I think Katarn is less useful on Nera Dantels, only because Nera has what appear to be some better options for maintaining TLs and having a wide variety of possible targets for her torps (namely Weapons Engineer or Recon Specialist and Deadeye) than some of the other B-Wings. Katarn could also certainly be useful on a YT-1300, but with the YT’s very favorable maneuver dial, he would only be effective (usually) on a green maneuver following a K-turn unless the YT has some other way to generate stress. Now, of course, he might be useful after someone hits you with a flechette torpedo too, but that very much depends on the meta and what your opponent happens to be running at the time, which can be highly variable. Thus, I think that if one is to run Katarn with the YT-1300, one usually wants to have that YT set up with PTL or Opportunist in order to make stress generation more predictable. Elusiveness would also work to generate stress, but getting the focus token when you need it is a little less predictable in that case, since it relies on your ship being attacked by someone to help you generate stress. Having a friendly ship with Wingman nearby could also come in handy to pull a stress token off at the beginning of the combat phase which would activate Katarn and give your YT an instant focus token. 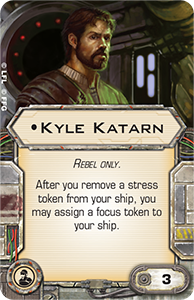 Note that Katarn’s ability doesn’t work just once per turn, so if you can find ways to stress your ship and then pull the stress off, you can keep on getting focus tokens till the cows come home. As I alluded to above, the focus token that Crew Member Kyle Katarn generates is not particularly useful during defense on the YT-1300 or the B-Wing, since those ships have only 1 Agility, and hence 1 green defense die to roll. Having a focus on defense for those ships gives you only a 1 in 4 chance of using Katarn’s focus token. Thus, on those ships, you really want to be able to use it on offense or to activate some other ability (like Deadeye for instance) during the combat phase. With the HWK-290, however, Crew Member Katarn could be useful on defense (since the HWK has 2 Agility) as well as offense. On offense, an obvious idea is to put him in the crew slot along with a blaster turret. With the considerable number of red maneuvers available on the HWK, getting stressed and then shedding said stress isn’t too much of a problem during most turns. Having him ride along in Jan Ors’ ship is a natural fit since her card text allows her to take on stress when a friendly ship is attacking in order to enable the friendly ship to roll an extra red die. Running her with PTL and Katarn might be overkill, but if she’s alongside a friendly PS 8 or 9 with Wingman, then the following ridiculous scenario could take place: Jan with a stress token from last turn pulls a green maneuver and loses her stress, getting a focus token from Kyle. Jan then focuses and TLs with PTL giving her another focus token and another stress token. At the beginning of the combat phase, her Wingman friendly at Range 1 pulls a stress off of her and Katarn gives her another focus token. Her friendly Wingman then attacks. Jan has no stress token so gives her Wingman friendly an extra red die and takes on a stress token. Jan then reaches the attack phase as a PS 8 pilot with 3 focus tokens and a TL. This lets her fire her blaster turret, and focus and TL the shot. On the next turn she pulls a green and this process repeats (perhaps). You can always save one of the focus tokens for defense if you don’t wind up needing all three of them. Not bad, eh? So this brings us to Crew Member: Jan Ors. 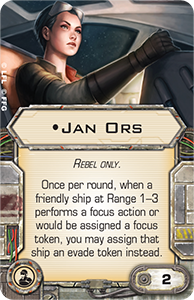 Jan Ors: Crew Member costs 2 points and lets you assign an evade token to a friendly at Range 1-3 when said friendly takes a focus action or would be assigned a focus token. So first off, let’s note that the only conditions are (1) that the ship being affected is at Range 1-3 and (2) would be assigned a focus token. Thus, Jan is useful as a Crew Member on any ship, since the ship she is riding in doesn’t necessarily have any impact on what happens. I am not sure if the ship she is riding in counts as a friendly ship at Range 1-3, so my first point of contention is whether she can be used to generate evade tokens for the ship she is sitting in. I would tend to think that she can, but I am not sure about that. It depends on what the definition of “friendly ship is”, but not on what the definition of “is” is. The second point is that this works only once per turn, so effectively you can only generate one evade token with her. I don’t find Jan to be an earthshattering card, but there are a few good circumstances where she could be used. For instance, assuming she can affect the ship she’s in, placing Jan and Kyle: Crew Members in a Chewbacca YT-1300 with Millenium Falcon and PTL costs 51 points. Good luck shooting that down. Here’s what happens: On Chewie’s turn he takes an evade action and then uses PTL to take a focus action which Jan converts to an evade token. He now has two evade tokens and is stressed. When he gets shot at, he has 2 evade tokens to spend and 1 green die to roll. On the next turn, he pulls a green maneuver, shedding his stress and receiving a focus token from Kyle, which he turns into an evade token via Jan. He then focuses and evades with PTL again. Rinse and repeat. When you don’t need the evade tokens…don’t use Jan’s ability and focus and TL instead. It’s not much for offense but it’s FAR harder to shoot down than a regular Chewie Falcon…which ain’t easy to shoot down to begin with. Even if Jan can’t affect the Falcon she’s riding in, you could place her in another ship riding alongside at Range 1-3 and do this same thing. Of course, you can do this on Lando’s and Han’s YTs too. It just costs more and you can be critted more easily. Having Jan riding in Kyle Katarn’s HWK-290 with a focus build (i.e. Recon Specialist, Moldy Crow, Blaster Turret, etc.) is obvious also. Katarn’s ship’s card text generates a bunch of focus tokens that you dole out to whomever is around, permitting Jan to give them evade tokens instead, as needed. Using Crew Member: Jan Ors in such a way as to protect a ship that has Stealth Device is another legitimate use of her ability. Thus, I think that generally on ships without the evade action in the actions bar, she just gives you the possibility of preventing one damage per round somewhere within Range 1-3, but on a ship that has the evade action in its bar (meaning A-Wings, E-Wings, and the Millenium Falcon), then Jan can effectively let these ships dodge 2 points of damage per turn, which on a heavy defense build, could be quite difficult to take down. So, however it is that Jan is useful, I think she is most useful with A-Wings, E-Wings, and the Falcon where she can really create a high level of shot obstruction on a defense oriented set up. All told, these cards create some new interesting options which I’m eager to experiment with on the table.